The remainder of this post is from the official press release about the opening of the play, but I wanted to throw in my 2 cents first. I’ve been fortunate to sing alongside both Paul Friesen and Sandy Glickfeld, and they are both excellent performers. Sandy is one of those people who grabs hold of the audience — she has the charisma to get people engaged, and a fabulous voice to go with it. I sang in a small chorus behind Robert Goleman in the lead on a Gilbert & Sullivan piece, and you won’t believe how strong his voice is…. Sandy and Robert also perform together in a magic act. I hope to see you there! Now, back to the official story. Going to A Witch and Giant Spotted in the Redwoods! 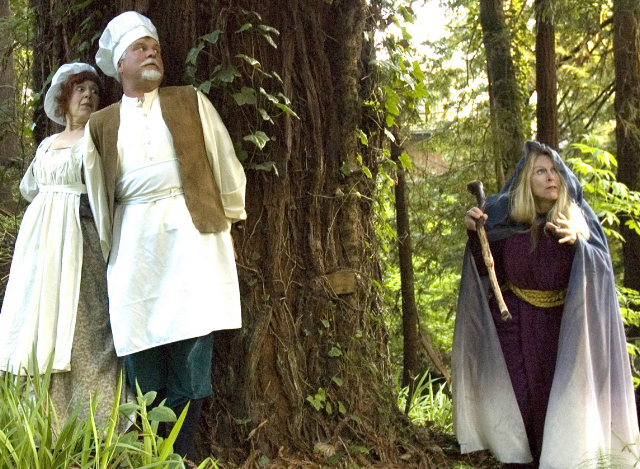 Recently a witch and a giant have been seen in the woods, causing much concern…a six-foot wolf was also spied. We’re pretty sure they’re up to no good or at the very least they’re up to some mysterious mischief. However, Gloriana Musical Theatre has convinced them to act and sing in the production of Stephen Sondheim’s “Into the Woods” where they can do no harm to our community. The community is invited to see Sondheim’s version of what happens when fairytale characters don’t – well, act like fairy tale characters. August 22 – Opening Night Gala – through September 28. Times are 7:30PM on Fridays and Saturdays, 3PM on Sundays at Eagles Hall Theatre, 210 N. Corry Street in Fort Bragg. This review is by Larry Wagner, our itinerant theatre critic. Rabbit Hole, Mendocino Theatre Company’s latest production, won the Pulitzer Prize in 2007­—and it wasn’t even nominated. You will understand why it got the great honor when you see it—as you must. Director Kennedy White delivered what I judge to be one of the closest to perfect productions I have seen. Playwright David Lindsay-Abaire’s script is flawless and White’s cast of pros, Beth Richmond, Cynthia Triplett, Michael Rossetti, and Lorry LePaule and a talented high school senior, Connor Barnard, execute their roles with great balance. They are neither overdone or understated. The story, in a word, is about coping. I won’t give away the story. Let me simply say it was real—so real that the audience on opening night gave them a standing ovation. Get your tickets now ­at 707-937-4477. Mendocino is Hopping in August! The month of August always amazes me because there are so many things going on. We manage a pretty comprehensive calendar on MendocinoFun.com (thanks, Nancy! ), and we put out a monthly calendar as PDF. We send this calendar out to local lodging establishments and others, and put out printed copies at several visitor centers. This month, there were 46 events listed for August! If you are coming to Mendocino in August, download the PDF file and print it for your convenience. And remember, according to the National Weather Service, the average maximum temperature in August is 64.6 degrees. If you’re baking away inland, come on over!